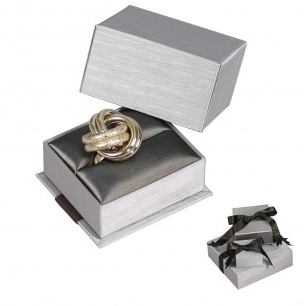 Out of all the famous jewelry stores, one has thoroughly stand out on their marketing and branding by using a simple packaging box. 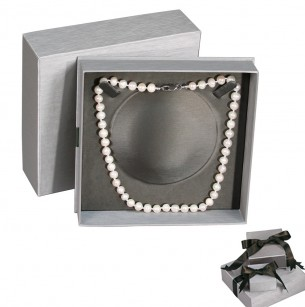 No, let me correct, because this packaging jewelry box is not as simple as it is now. More popularly known as the iconic blue box of Tiffany, this jewelry box’s color has even been patented (No. 1837) and trademarked on the year 1998. Actually, the Tiffany’s iconic blue box overall look is trademarked along with the white satin ribbon tied around the jewelry display box for its gift-wrapped look. This means that no other jewelry company could ever use the same idea in their commercial efforts, securing the idea for the company alone. But really? How did this iconic box came to be? And how did it became so successful that it worked out as a brand marketing success out of all the other commercial efforts? How did it become as the most recognized retailer container in history? Well, according to Tiffany & Co. Press, the color of the box which is now known as Tiffany Blue was selected by the company’s founder Charles Lewis Tiffany for the cover of the Blue Book, which was Tiffany’s annual collection of exquisitely handcrafted jewels, published in 1845. Referred to as robin’s-egg blue or forget-me-not blue in the 1800s, the color was actually chosen since the turquoise gemstone was very popular among the Victorian brides back then. Not long after, the color was then used by Tiffany in all their advertising and promotional materials including their jewelry box. It was then on 1905 when The New York Sun was an icon of luxury and exclusivity. By 1961, when Paramount Pictures then released the movie Breakfast at Tiffany’s which stars a young Audrey Hepburn back then. The store became more popular due to the movie, as well as the blue box. In fact, during the filming, Tiffany posted 40 armed guards on the floor to prevent any blue box from missing. That’s how popular the jewelry box. Some pieces of jewelry was actually inspired by the box itself. As of today, the iconic blue box continues to be what’s it’s known for. Out of all blue hue, the Tiffany blue continues to embodies the luxurious and exclusive characteristics that Tiffany jewelry are known for. 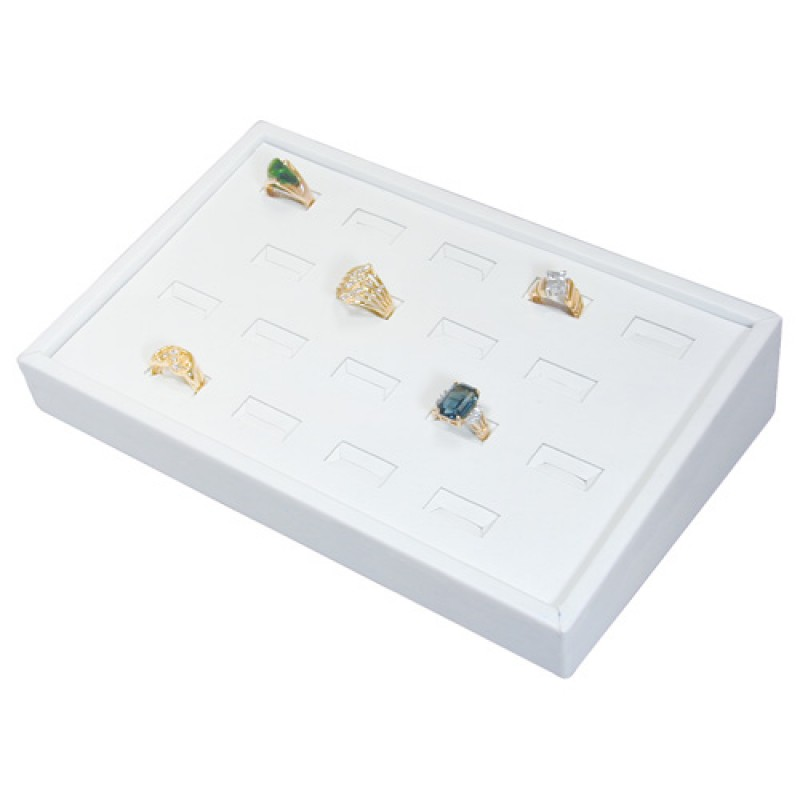 Showcase trays are often the perfect jewelry displays to use when putting up a booth during a tradeshow event. Since they are easier to assemble and organized, jewelry retailers favor this type of jewelry display out of all the others. But if you don’t have the slightest idea on what type of showcase tray then you will certainly find the info below useful. 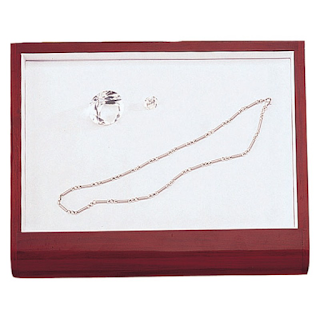 Versatile showcase trays are jewelry displays that can usually handle or display a variety of jewelries from rings, bracelets to earrings and necklaces. 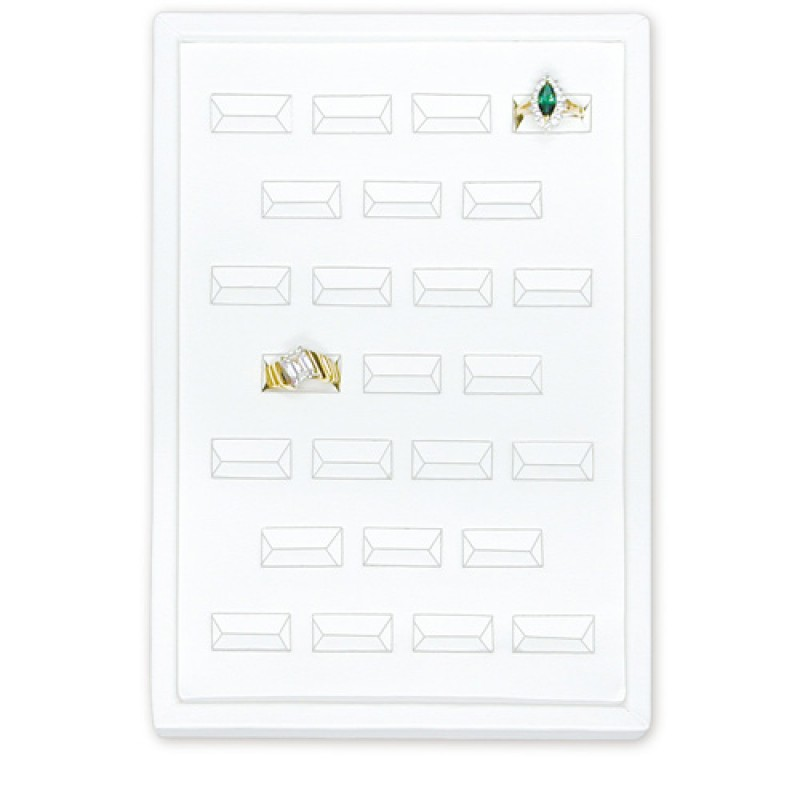 Some showcase trays can handle just one kind of accessory but can hold up to 10 jewelries or more. These versatile showcase trays are often stackable for easy storage and carry, that’s what they are often used for tradeshows and outdoor events. 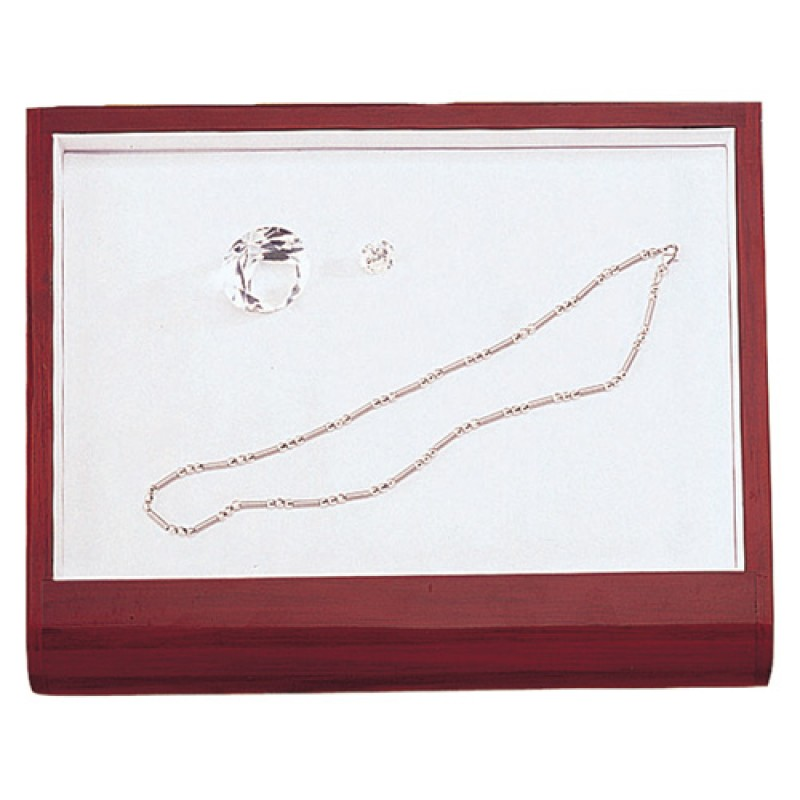 Like any showcase trays, slanted display tray can hold several jewelries at one time. 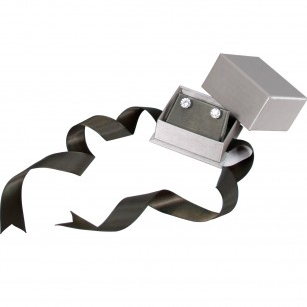 These makes them the perfect jewelry display to use during outdoor events. The only difference the slanted display tray from the others is that it features an angle tray, giving it an appealing visuals. If you don’t like the flat visuals the other display trays has, then slanted display trays are perfect to use when displaying your main jewelry collection. 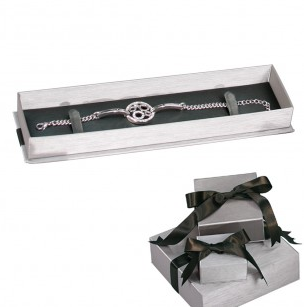 Curved display tray usually possessed a dimension visuals that works well when displaying bracelets and rings. To make the most out of its visual characteristics, you can pick out a curved display tray that can handle several rings and bracelets. There are rings display that can hold up to 20 rings or more like this Ring Tray from NileCorp, which has a dimension of 9 3/8"W x 7 3/8"D x 7/8"H and holds 23 rings. Stackable display trays are perfect for people who wants to keep everything already organized before going to a tradeshow or outdoor event. What makes a stackable display tray different from other showcase trays is that it is divided in several displays which you can later stack on the tray itself. Such features allows retailers to already put on the jewelries in display then later on stack it on the tray to easily assemble and organized their jewelry for the event. Let’s face the truth, even a few amount of makeup can clutter the bathroom especially when you’re sifting through your beauty kit on a hectic Monday morning as you get ready for work. But who wants a cluttered mess when you get home? No one, right? So why don’t you ditch this routine, and follow these 5 cool tips on how to keep your cosmetics organized. 1. First and foremost, the best solution I could give you is to buy a cosmetic make-up organizer. Like jewelry display boxes, cosmetic organizer is the perfect item to keep everything in order. 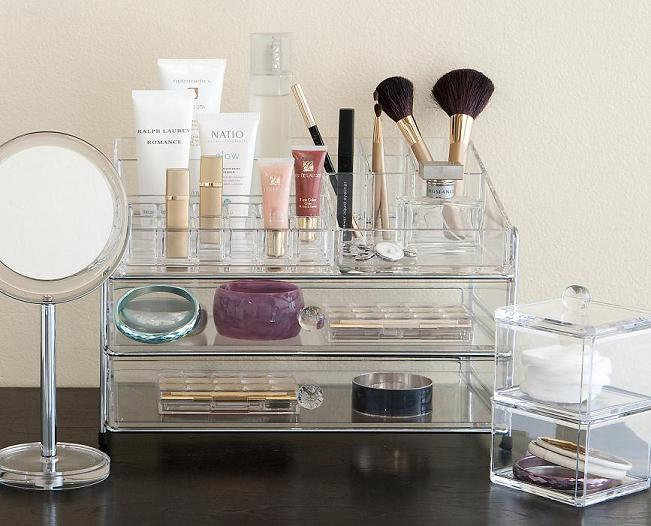 There are several cosmetic organizer in the market, and I suggest to buy an organizer that has a mirror in it and has several rooms for separate your brushes, lipsticks, moisturizers and creams, makeups. 2. Use a spice rack to keep your perfumes organized. An unconventional tip given by Cosmopolitan, it creates a nice concept that looks like you’re displaying your collection of perfumes. 3. Create a beauty corner. If there is an extra space in your bathroom or room, I suggest that you put an small table and chair in a corner and create your own little make-up corner. You can also arranged your beauty products on top of the table. 4. Recycle your old perfume jars and bath bottles. Fight the urge to throw empty perfume jars and bath bottles, and instead wash them then use them as as containers for your brushes. You can also use them as flower vase and decorate your beauty corner. The best way to fix the clutter first hand is learning how to divide your drawers by using dividers. Learn how to separate your blushes, eye make-up, and lipsticks. In this order, it’ll be way easier for you to do your business every morning. Packaging your jewelry and earring displays, plays a great role in giving a lasting impression to your customers, take TIffany & Co. which grew popular with its blue packaging box. 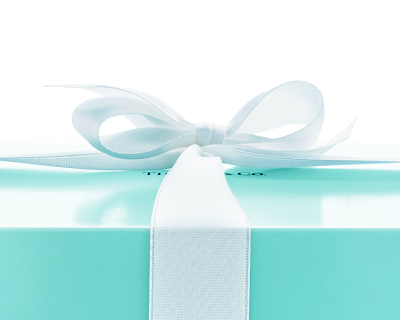 The box was so popular, it’s color was even patented to Tiffany. So if you’re looking for a new and yet elegant jewelry boxes to use in your jewelry store, then NileCorp has this new arrival elegant bowtie jewelry boxes in their inventory. 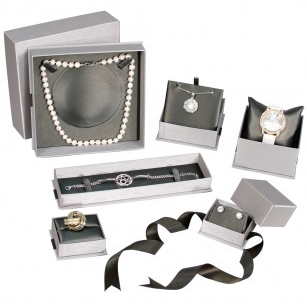 Jewelry boxes have always been used as a tool for keeping jewelry collection safe. They come in different sizes and design. 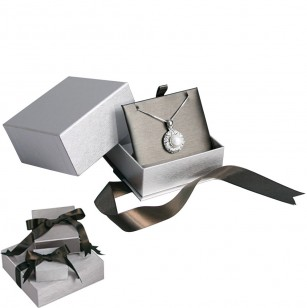 But like jewelry, some jewelry boxes are created for the sole purpose to standout. These jewelry boxes are known for their unique designs and features, and they also come in incredible prices. Just imagine a jewelry display box way expensive than a jewelry? 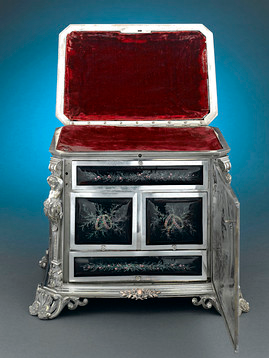 How about a jewelry display box that costs $29,850 which is almost the same price of an 18k diamond engagement ring? Well, actually it does exist, which is currently being sell by M.S. Rau Antiques. This rare and elegant jewelry display box is the Enamel Bronze Jewelry Casket that displays an exquisite Limoges enamel artistry giving it an antique look that couldn’t be more perfect to store valuable and heirloom jewelry. Created in France during the 19th century by Europe’s largest porcelain manufactory known as Limoges, the Enamel Bronze Jewelry Casket is an antique jewel box that possessed this elegant enamel artistry that Limoges is best known for. It features a deep maroon and velvet interior with a casket that has a front and side panels painted with masquerade scenes, while its rear panel is designed with a night landscape, and its lid painted with artistic allegories. Its front panel when opened reveals four drawers, all designed with floral etches that completes Victorian-reminiscence appearance. 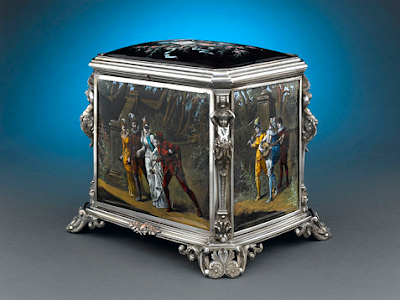 This charming jewelry box is best known for the artistic painting adorning its panels that was signed by L. Coblentz on its top panel. As of now, the Enamel Bronze Jewelry Casket is the one of the most expensive jewelry box in the world which is offered by M.S. Rau Antiques along with its other antique jewelry boxes. With a price of $29,850, it has a width of 12” inches, a height of 10” inches and depth of 9” inches.